You may have reached a point where you are fed up with the fumes of gasoline saws, the cords of electric saws, and the constant charge and re-charge of batteries for cordless saws. What is a homeowner to do? Well, there are still plenty of options for manual pole saws out there – and we guarantee the models of today do not actually involve a ton of manual labor. Read on to learn more about the benefits of using one of these. It is true that manual pole saws definitely require more labor than gas, electric, or battery powered pole saws. There is just no way of getting around that. But it is also true that some options have designs or blade configurations that will make them more efficient to use than others. Look for these features when selecting a saw. Weight is especially important when it comes to manual pole saws. They need to strike the right balance between being heavy enough to let the saw’s weight do most of the work when making cuts, yet not so heavy that the user will become fatigued. Look for a saw that strikes this balance perfectly. Manual pole saws do require a lot of work, so you definitely want to see a lot of output from your purchase. That means you will want a saw that can reach a wide range of different limbs and plants. Well made of high quality material. The Silky New Professional Series Telescopic Landscaping Pole Saw is the premiere model on our list. It really addresses the biggest gripe in use: that using a pole saw manually is a lot of hard work! The Silky takes this dynamic and turns it on its head with a razor sharp set of saw teeth that are so powerful they will chomp straight through any branch with little to no extra effort, even when the saw is fully extended to its maximum capacity. This quality is helped out by the angle of the saw, which is specifically designed to make quick, easy cuts. There is not much the Silky New Professional Series Telescopic Landscaping Pole Saw will not be able to accomplish for you. The Silky New Professional Series Telescopic Landscaping Pole Saw is an excellent choice that can save a lot of time and effort for its users. Just know you will need to watch the saw bolts and tighten them up from time to time. The Jameson LS-6PKG-6 LS-Series Pole Saw Kit is a versatile little model that can be used for a wide variety of jobs. This quality is accomplished through the inclusion of three different pole attachments to be used with this saw: one that extends up to six feet, one that extends up to twelve feet, and one that extends all the way up to eighteen feet in the air! Too good to be true? You better believe it! With all the different attachments, you may think this saw would be difficult to handle or to use, but as a matter of fact it is easy to switch the attachments in and out and the initial assembly of this saw typically takes less than ten minutes. It is an effective option that can chomp through thick limbs with ease and in no time at all. You can’t go wrong with the Jameson LS-6PKG-6 LS-Series Pole Saw Kit. The Jameson LS-6PKG-6 LS-Series Pole Saw Kit is a great pole saw kit that allows for a wide range of different cuts. It is on the heavier side when you have it extended all the way to eighteen feet, but what more would you expect? 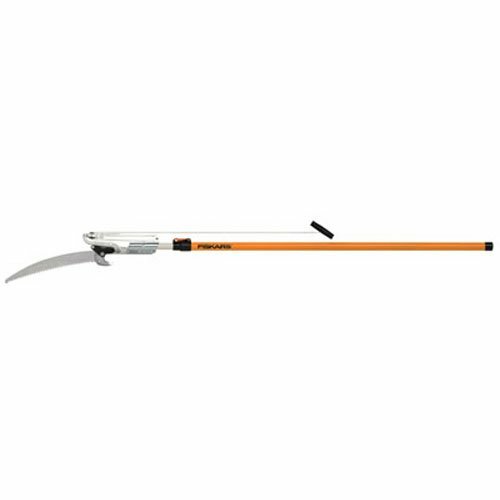 The Fiskars Power-Lever Extendable Tree Pruner is an excellent choice with a good amount of versatility. When you buy this saw, it comes with two end attachments: the saw attachment for bigger branches, and a pruner attachment for smaller branches that are younger and not yet stiff enough to saw through efficiently. So you can really run the whole gamut of different types of cuts with this Fiskars saw. Do not think for a second that just because it can do a lot of things, it is one of those situations where it can’t do one thing especially well, though: this saw can definitely hang with the best of them when it comes to cutting through tree limbs. It can saw through limbs up to four inches in thickness like they are absolutely nothing. Best of all, it has one of the longest reaches of any saw on this list with a full fourteen feet of extension! 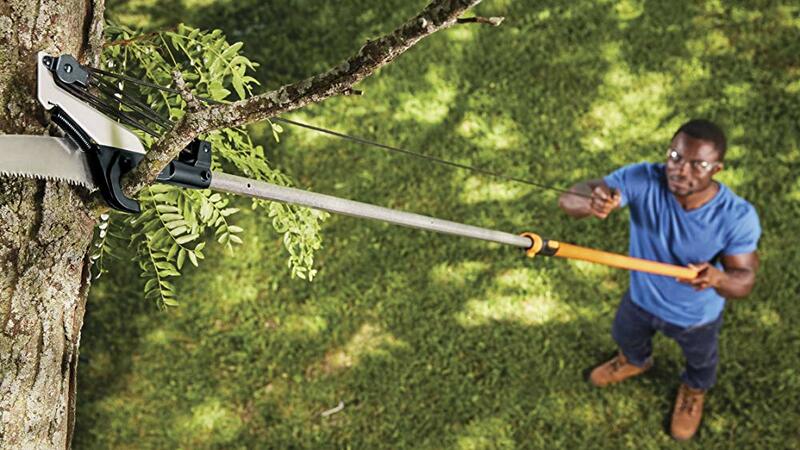 If you are looking for a saw that can really do it all, look no further than the Fiskars Power-Level Extendable Tree Pruner. The Fiskars Power-Lever Extendable Tree Pruner is a great saw with a wide range of versatility to make multiple different kinds of cuts. These cuts can still be made efficiently even at full extension, though the saw does become wobbly at that point. The Silky 272-18 Telescoping Zubat Professional Series Ultralight Pole Saw is probably the most accessible options on this list. 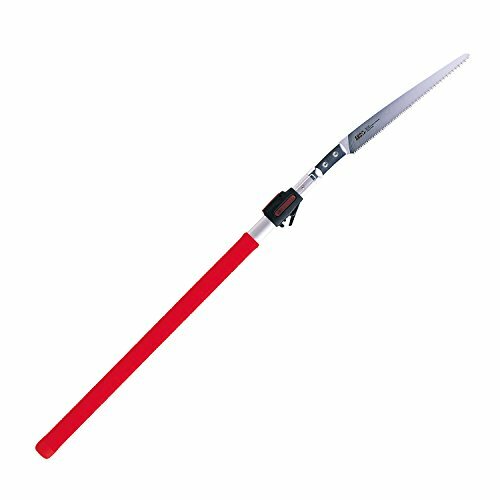 If you have ever thought one of these might not be a good choice for you because of the strength needed to use it, the Silky Telescoping Zubat is definitely the manual pole saw you should go with. The blade is so sharp when it arrives that Silky includes a protective blade guard with this saw so that you will not accidentally cut yourself while transporting it. The sharpness of the blade allows for the saw to easily cut through tree limbs up to five inches in thickness, despite the fact that it is noticeably lighter than most other options and so does not have a lot of weight to apply pressure to the branches. It also will not cause any hand cramps from long term use, as the handle end has a rubber grip for easy holding. It extends up to fifteen feet in the air, so there is not much you will not be able to cut. 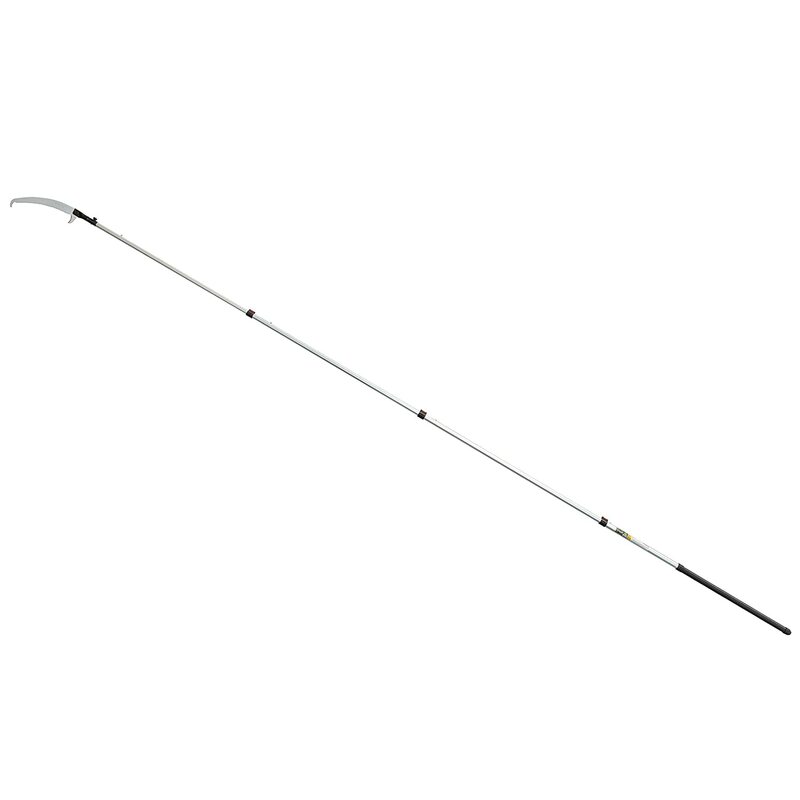 The Silky 272-18 Telescoping Zubat Professional Series Ultralight Pole Saw is an ideal saw for those who do not feel these are an option available to them. The pole is on the thinner end, but for homeowner use it will more than do the trick. The ARS SC-EXW18 Telescoping Pole Saw is one of the most high quality options you will be able to find out there on the market today. It is designed to accomplish a different kind of yard maintenance than the other saws on this list, as it is much shorter and is more engineered to cut through plant growth that is closer to the ground. With that being said, the blade is incredibly sharp, so it can easily saw through hard, thick, dense plant overgrowth that would stymie other saws. The saw’s teeth are fine enough that this saw is excellent for making smaller, more precise cuts, so this saw would also work great for pruning or other cuts that require a level of aesthetic precision. If you are looking for a pruning saw that is good at ground level cuts, the ARS SC-EXW18 Telescoping Pole Saw is the choice for you. The ARS SC-EXW18 Telescoping Pole Saw is an awesome pick for cutting growth that is closer to the ground, as opposed to giant tree limbs up overhead. Because it extends to only six feet in length, it is shorter than most other saws reviewed here and therefore has less versatility. There is no getting around it – using one of these can be a lot of work. You want to find a model that does not have any additional complicating factors like a complex assembly process. Nicer options are typically easier to use and can save you a good deal of time. As with any tool, the nicer initial product you buy, the less time and money you will spend on maintenance and upkeep over the years. These are no different. We guarantee you will not regret spending a little bit more up front for a quality product that will stand the test of time. The more high quality saws often come with additional attachments and pole extensions so that you can make a wide variety of different cuts at varying heights. If you are going to invest in one, make it one you can use for a lot of different activities. What is a Manual Pole Saw Best Used For? Manual pole saws are best used when pruning, or in other situations where neat, precise cuts are necessary for aesthetic purposes or to encourage regrowth. They are also great for making cuts to tree branches that are super high, as many are lighter than gasoline powered pole saws, electric, or battery operated models, so they are more easily manipulated at higher heights. 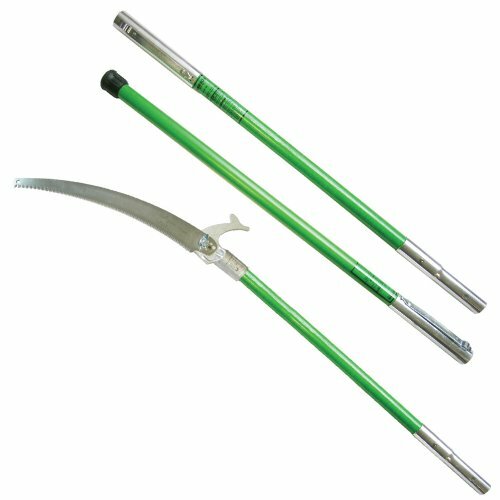 These saws are ideal for light yard work that does not require a large amount of sawing or clear cutting, as that work can become tiring quickly when using manual power. Manual pole saws may be a little more work up front, but they will save you money in the end that you will not need to spend on gas, electric, or battery power. If you ensure you take the features listed above into consideration and find the right choice for your needs (and there are some great options on this list!) we guarantee you will not regret your purchase.